First, a note about Ameraucanas vs. Araucanas. 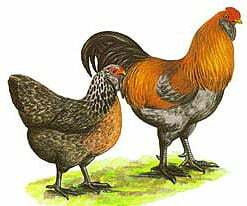 Both breeds lay eggs with shells colored various shades of blue, have pea combs, and should have red earlobes. Beyond that few similarities exist in specimens meeting the requirements of recognized poultry standards. Perhaps 99 percent of chickens sold as Araucanas (or Ameraucanas) by commercial hatcheries are actually mongrels, meeting the requirements of neither breed. 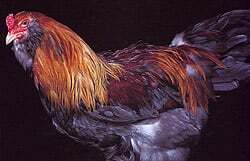 The Ameraucana breed has a tail and sports muffs and beard in the facial area. These characteristics are true-breeding. The Ameraucana breed was formulated and standardized, primarily in the north central U.S., to provide a colored egg fowl possessing more practical and true-breeding characteristics. Ameraucanas were recognized as a separate and distinct breed in the early 1980's by the A.P.A. and by the A.B.A. Eight varieties have been recognized by both organizations since 1984. They are: Black, Blue, Blue-wheaten, Brown-red, Buff, Silver, Wheaten, and White.